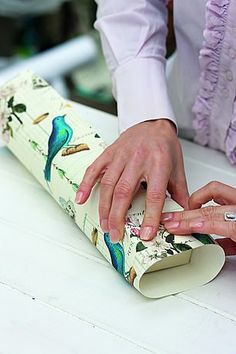 With Summer here and your close friends tying the knot, it’s your chance to be Wrapping a Wedding Gift and making it stand out, making the special couple feel rewarded. Even if you’re giving money or a voucher, we can make your gift look fabulous on the present table. Arranging a wedding can be a joy but it also involves a lot of hard work, coordinating, planning and organising. Each bride is the proverbial graceful swan, paddling away like crazy, to ensure that everything appears perfect. Extensive effort is invested in colour schemes, dress designs, fabrics, flowers, table arrangements, stationery designs, favours, photography, menus, venues and honeymoon plans, to list but a few ‘things to do’…. As a guest, turning up beautifully turned out is a courteous duty to your, no doubt, immaculately polished hosts and, after you have been invited to share this precious and poignant moment in their lives, to observe, dine and celebrate, it is a wonderful gesture to, not merely give a considered gift but to present or, indeed, have delivered, a perfectly and elegantly embellished feast for the eyes, in the form of a thoughtfully wrapped and individually outstanding present. The bride will appreciate such a wonderful gesture, as she has, no doubt, spent many months, at the very least, considering every last detail of every last minute of this very special occasion. 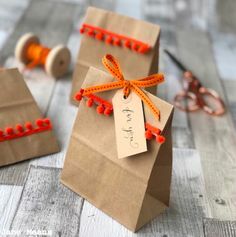 Your gift may not be the most expensive or flamboyant but it can be remembered for being the most perfectly packaged and for being the gift the happy couple least wanted to open because the wrapping was so utterly charming. Just as pin-tucked, fine silk pleating adds detailed embellishment to an elegant wedding gown, once mastered, this simple paper-folding technique adds intriguing intricacy and individuality to your wrapped wedding gift. 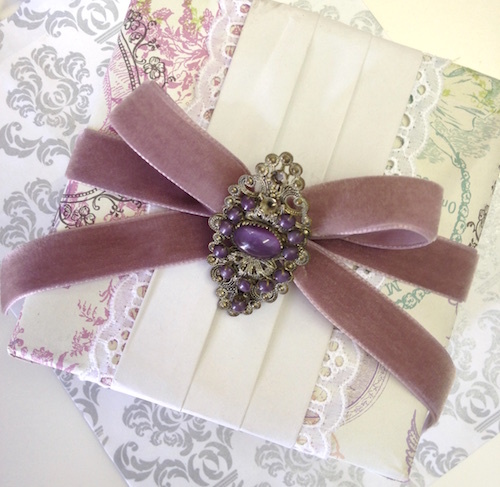 If the bride’s colour choices are known, carefully selected papers and ribbons can also compliment her colour scheme. 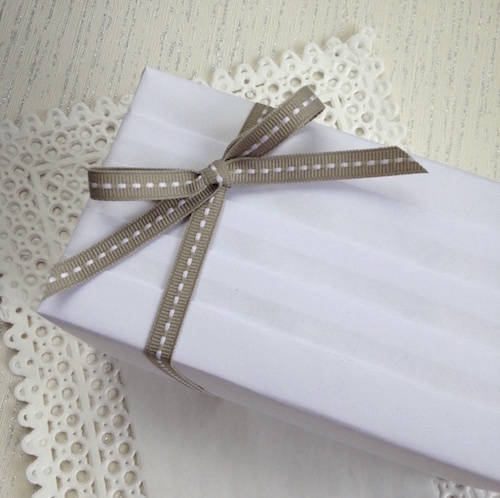 Just as the happy couple will be joining their hands in marriage, two contrasting papers can be used to wrap their wedding gift. 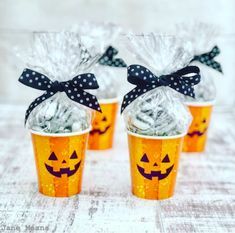 Cover the join with a good quality ribbon, tied in a bow, that may secure two small rings (curtain rings look effective, fresh or dried flowers or, if it is appropriate, a pendant in the shape of a cross. A very special bottle of wine or good quality champagne makes a lovely wedding gift but many people tie a tag to the neck of the bottle and stop there. We can do much better than that! 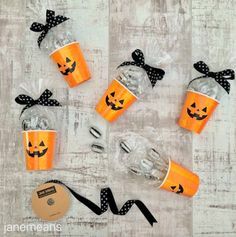 With contrasting tissue papers, shiny cellophane, ribbon and the accessories of sparkly confetti or flower stems, a bottle can become an ornamental vase of a gift. A generous helping of confetti between the tissue paper and cellophane adds real sparkle to your champagne! Perhaps the happy couple are adventurous travellers and a more personalised gift wrapping style would really appeal to them… Do you know where they are going on their honeymoon? 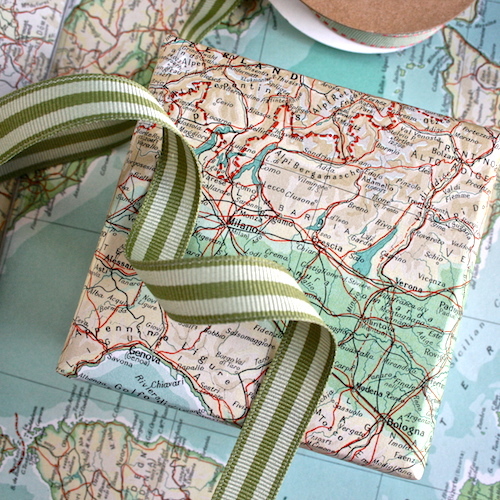 If so, use a map of that destination to wrap your gift, ribbons of that country’s flag and a card-backed photograph or postcard of the location as a gift tag. 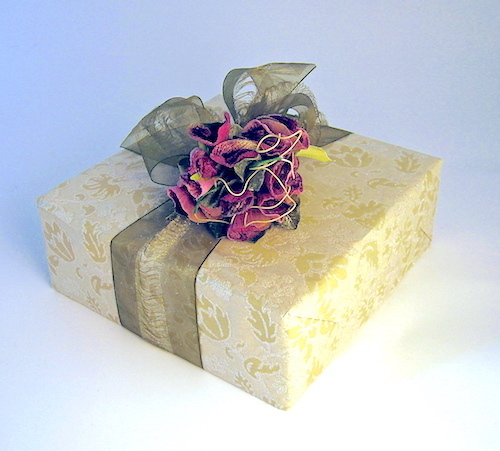 Simple boxes are perfect to be dressed for a wedding celebration. 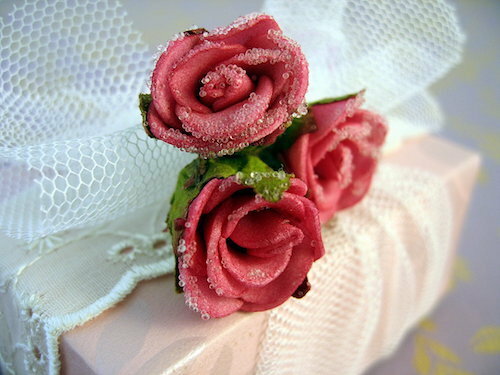 With wedding veil net wrapped around and secured with a bunch of faux roses, an ornate broach or adapted hairclip or piece of jewelry, they look dramatic and yet are very quick to wrap. A generous, soft lining of contrasting tissue paper also adds a little richness to whatever delights lie inside the box. For the bride who loves bling! Wrapping your gift in sumptuous velvet will immediately make it stand out from the crowd. Jewel colours of emerald green, amethyst purple or ruby red will add to the drama and, tied with a matching metallic edged, wide wire ribbon bow and dressed with lots of wired cut glass and metallic beads, your gift will have glamour and beg for the spotlight. I also love to wrap wedding gifts in bling paper and this glitter one was a remnant from Christmas. With a rich embellishment added your gift will look a million dollars. Romantic silk, pink and pearls. 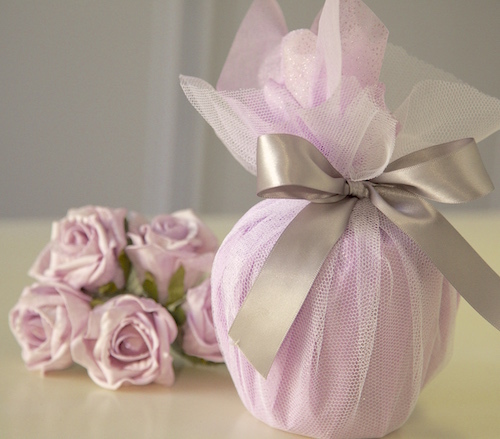 A parcel presented, wrapped in light pink silk in combination with a pretty floral, pleated paper, tied with darker pink ribbon and entwined and draped with strings of pretty bridal pearls will look innocent and sweet. 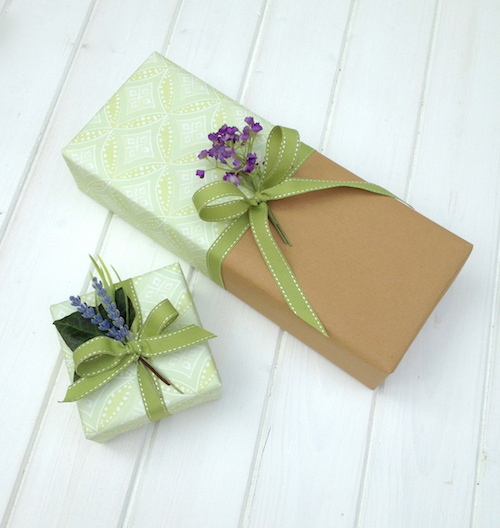 Remnants of fabric can be purchased cheaply and make great wrapping for many occasions. 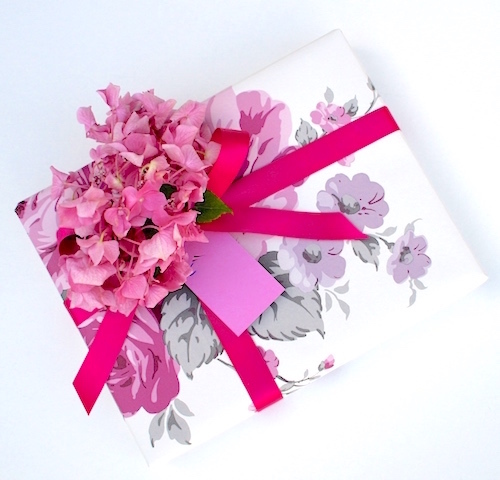 Add a sprig of pink and cream flowers to this gift box for extra femininity and romance. You can even use a paper tablecloth and netting as I have done here. 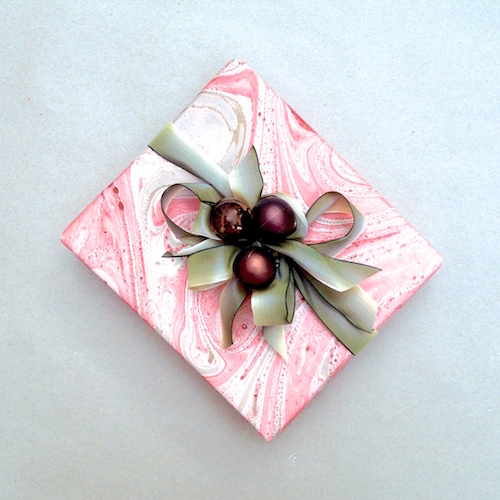 This luxurious Rossi marbled paper is perfectly suited to a wedding gift’s presentation. 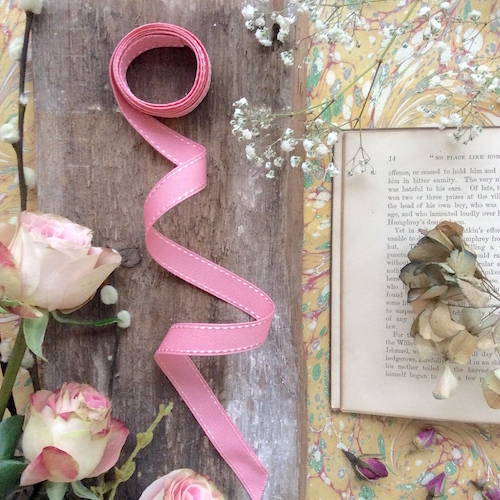 The rich texture and variegated colours of this Italian, handmade and unique paper can be complimented with green or pink ribbon. This is a great look for a Winter wedding too. 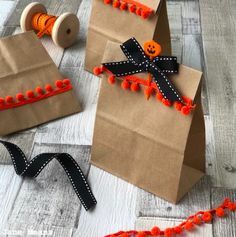 Plain brown paper dressed up for the occasion with grosgrain ribbon, and a bouquet of (artificial) flowers, proves that it is the ‘little black dress’ of the gift-wrapping world. It may be simple, but, with the appropriate accessorizing, it works for any occasion. Whatever you give to the Bride and Groom, with a little thought and effort it will make them feel really special on their Wedding Day. 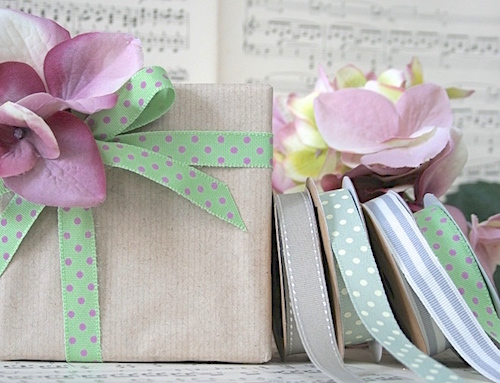 We’d love to hear from you if you’ve been creative with your gift wrapping too!